Have a look at the updated concept plan for Anders and Dorrit's Community Park and share your feedback by completing the Questionnaire by June 1, 2018. Anders and Dorrit's Community Park is located at 3734 Jingle Pot Road in Electoral Area 'C' within the Regional District of Nanaimo (RDN). The park is just outside the City of Nanaimo limits. The park property is 2.55 ha (6.3 acres) in size and is part of the Agricultural Land Reserve. The property is bordered by Jingle Pot Road on the Northwest and by farms on the Southwest and East. Half of the property is forested and the other half consists of open fields and a former house site with its surrounding residential gardens. An informal trail leads down to the Millstone River which runs through the southern part of the property. Anders and Dorrit purchased the property over 30 years ago and set about building a house and farming the land where they raised cattle, sheep and chickens. Anders and Dorrit were avid travelers as well as gardeners and over the years they established an interesting collection of ornamental trees on the property. In November, 2007 a letter was received from Dorrit and Anders Olesen asking if the Regional District was interested in their property for park purposes. Before he passed away, Anders Olesen sat down with parks staff at the Regional District of Nanaimo and developed concept plans for a community park which closely follow the Olesen's wishes. 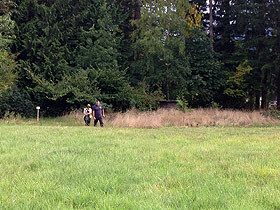 The property was transferred to the Regional District following Anders' death in May 2011. He was 86 years old. The park was officially opened to the public on September 5th, 2013. Are there other amenities that could be incorporated in the park? Should the house be removed or kept & renovated for community use? Which design concept do you prefer? 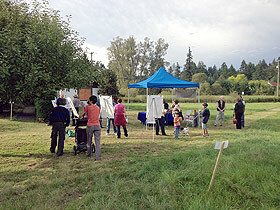 An open house was held at the park on September 5th, 2013. Over 60 community members came to speak with RDN Director Maureen Young, Parks and Open Space Advisory Committee members and RDN Parks staff to provide their input on the park plan. The open house information and questionnaire were available online between September 5th, 2013 and January 10th, 2014. Forty-nine (49) responses were received. The majority of support was for the removal of the house which was carried out in early 2015. Since then, the landscape has been maintained, with a perimeter walking trail mown around the field. It's now time to move forward with planning this special Community Park! An Open House was held on Saturday, April 28th from 1:00 to 3:00pm in the Park. The updated concept plan was presented along with additional information about the project and the park. If the rainy weather kept you indoors that day, it's not too late to share your input! Please check out the Concept Plan and share your feedback by completing the short Questionnaire - We look forward to hearing from you! Do you support the 2018 concept plan and moving on to the next phases of this project? Should the 'river walk', now a seasonal trail due to winter flooding, become a year-round trail by adding bridges or culverts? The updated 2018 Concept Plan - What has changed? The parking lot has been reconfigured so as to impose less on the plaza, picnic shelter and field areas. A trail paralleling Jingle Pot Road is also proposed. The picnic shelter is relocated to make use of the existing foundation from the former garage and to maximize views towards the plaza and towards the field. The Plaza intends to make use of chipped concrete and brick from the Olesen house site by creating gabion seat walls - a perpetual reminder of the Olesen's and their time on the land. 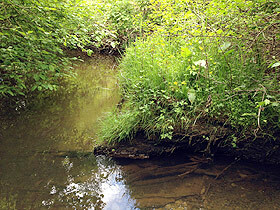 Consideration for year-round access of the 'river walk' with the possible installation of foot bridges or culverts.